I LOVE the Simon Says Stamp April 2018 Card kit. 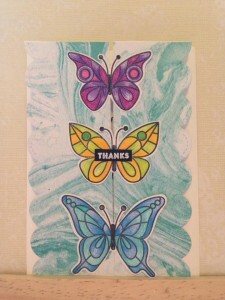 The stamp set, the patterned papers, the colors, the stencils…. They are all the best. This is the first card I made with this kit. 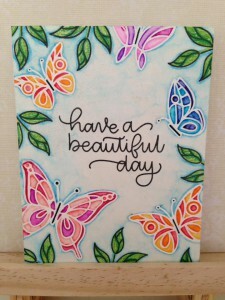 As soon as I saw the reveal, I know I wanted to white heat emboss those butterflies and water color them. Extra Details: I began this card with a panel of water color paper. 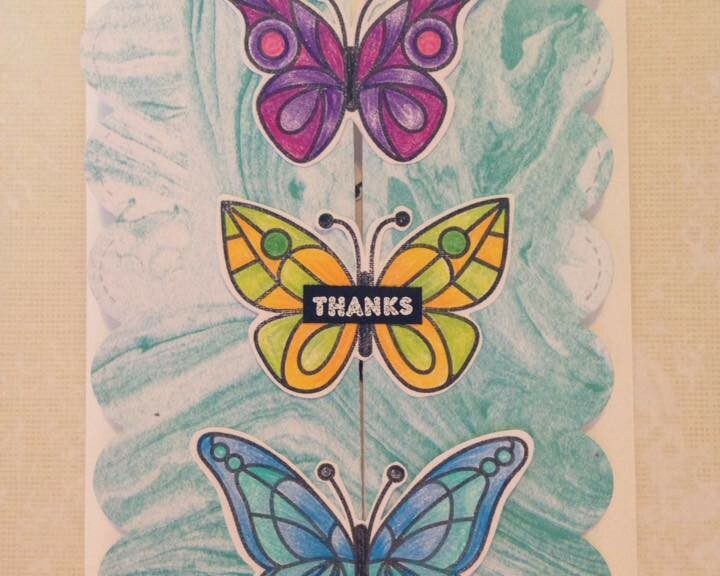 I stamp and white heat embossed the butterflies all around the edge of the panel. I added my sentiment and leaves with a black ink. I love the effect that was created by using both black ink and white embossing. I used the Crayola Fine Line Markers to add color and a water brush to move the color around. 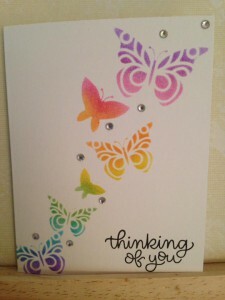 Once the card front was dry, I added some Wink of Stella all over background for some sparkle. Lastly, I adhered the panel to a white card base and the card was done. Jennifer McGuire did a video on Z fold cards a few weeks ago and I knew I had to try one. I used the Simon Says Stamp April 2018 Card Kit and some patterned paper I got from my local Joann’s to make this card. I colored the butterflies with Prismacolor pencils and really love the results I got. 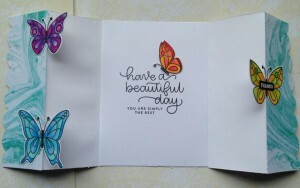 Extra Details: I began this card by stamping and coloring the butterflies on a scrap of white card stock. Once I was done coloring, I fussy cut all of the butterflies out. I created the card base from some 12 x 12 white cardstock. It was a very light weight card stock, so I don’t think I will be using it again. I added strips of the marble patterned paper to the outside flaps. I used a scalloped edge die to add interest to the front panels. I added a panel of white cardstock to the inside of the card to stiffen up the card base. 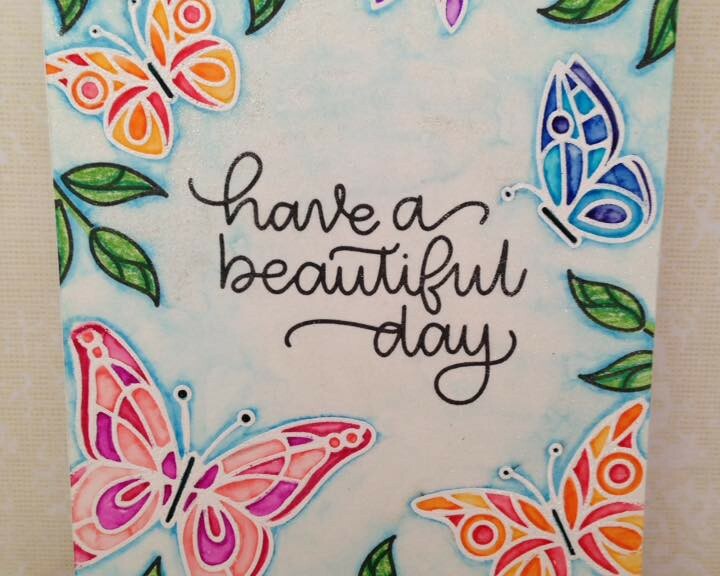 I stamped the sentiment and added a butterfly to this panel. I adhered the butterflies to the front panels having them overlap the seam. Lastly, I added a small black rectangle to the middle butterfly. I white heat embossed the sentiment on the black rectangle. It has been a long time since I’ve done any blogging. However, I have still been making cards so now I’m going to try to catch up now. This card was made using the Simon Says Stamp April 2018 Card Kit. I have really been enjoying the recent Simon Says Stamp Card Kits. I haven’t really played with stencils before so this was a fun experiment for me. Extra Details: I began by taping my white A2 card base down. I temporally adhered the stencil on the top and used Distress Inks and a Mini Ink Blending Tool to add the color. I used two colors for each butterfly. I stamped the sentiment in black ink. 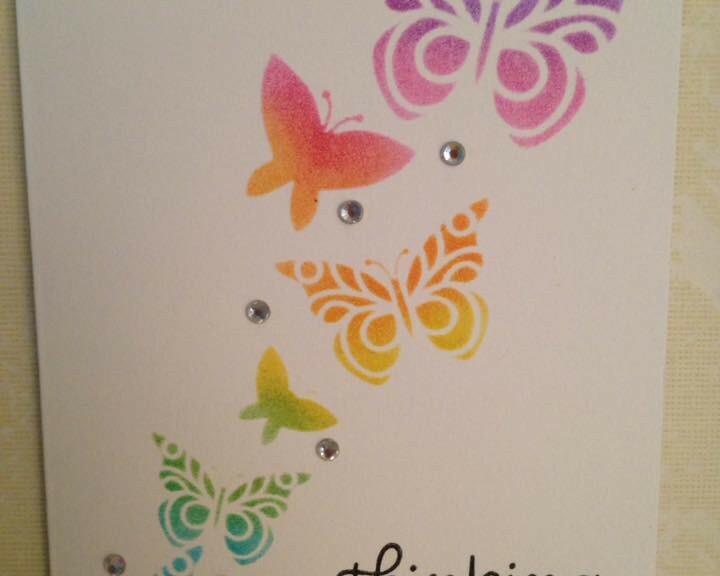 Lastly, I added some adhesive backed gems to the card for interest. Distress Inks in Picked Raspberry, Spiced Marmalade, Mustard Seed, Mowed Lawn, Mermaid Lagoon, and Wilted Violet.